The Fluke 45 offers maximum versatility in a single instrument. 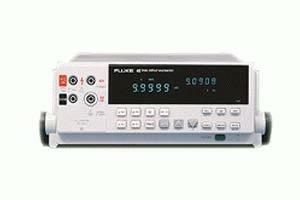 It is a feature-rich 5-digit, 100 000 count meter that truly fits all applications and virtually any measurement need on the workbench or in the field. Two multifunction displays and 16 different measurement capabilities allow wide ranging versatility at an affordable price. The Fluke 45 delivers high performance and flexibility for manufacturing test, depot and field service, as well as R&D applications. Multifunction vacuum fluorescent dual display allowing the user to measure two different parameters of the same signal from one test connection, and view both measurements at the same time.